A seasonal entry of 700 cattle came under the hammer at Clogher Mart on Saturday, December 1st producing a firm demand for quality stock in all sections plainer lots would harder to clear. In the fatstock ring beef cows sold to £1,386.10 for a 830kg Limousin at £167 per 100kg and selling to a top of £180 per 100kg for a 700kg to total £1,260. Cow heifers sold to £1,326.60 for a 670kg Limousin at £198 per 100kg followed by a 650kg Simmental at £175 to total £1,090.40. Fleshy Friesians sold to £114 for 740kg. Fat bulls sold to £1,383.20 for a 1,040kg Limousin at £133 and £1,322.40 for a 1,140kg Charolais at £116. Fat steers overage sold to £170 for a 450kg Charolais. Fat steers underage sold to £201 for a 460kg Limousin. Fat heifers underage sold to £189 for a 540kg Limousin. Suckler cows and calves sold to £2,200. Dairy cows sold to £1,845. Clogher producer 670kg Limousin to £198 (£1,326.60), Letterbreen producer 580kg Charolais to £188 (£1,090.40) and 520kg Charolais to £186. Maguiresbridge producer 700kg Limousin to £180 (£1,260), Augher producer 650kg Simmental to £175 (£1,137.50), Fivemiletown producer 600kg Limousin to £174. Augher producer 650kg Limousin to £172. Fivemiletown producer 830kg Limousin to £167 (£1,386.10), Newtownstewart producer 580kg Limousin to £163. Aughnacloy producer 840kg Limousin to £158 (£1,327.20) Dungannon producer 540kg Saler to £158. Newtownards producer 540kg Charolais to £156 and 540kg Charolais to £149. Carrickmore producer 600kg Limousin to £155. Fivemiletown producer 700kg Limousin to £154. Armagh producer 550kg Aberdeen Angus to £150. Coalisland producer 610kg Limousin to £149. Fintona producer 770kg Blonde d’Aquitaine to £148 (£1,139.60), Derrylin producer 570kg Charolais to £148. Clogher producer 600kg Charolais to £147. Other quality lots sold from £120 to £145 per 100kg. Second quality lots sold from £100 to £118 per 100kg. Fleshed Friesian cows sold from £108 to £114 per 100kg. Ballynahinch producer 1,040kg Limousin to £133 (£1,383.20), Markethill producer 1,140kg Charolais to £116 (£1,322.40), Pomeroy producer 890kg Blonde d’Aquitaine to £111 (£987.90), Newtownbutler producer 990kg Aberdeen Angus to £108 (£1069.20), Brookeborough producer 900kg Charolais to £95. Ederney producer 860kg Charolais to £93. 450kg Charolais to £170. 560kg Belgian Blue to £168. 510kg Limousin to £167. 560kg Belgian Blue to £158. 810kg Aberdeen Angus to £148. 690kg Aberdeen Angus to £128. 480kg Aberdeen Angus to £128. 460kg Limousin to £201. 590kg Charolais to £180. 560kg Belgian Blue to £176. 610kg Limousin to £170. 660kg Charolais to £170. 670kg Hereford to £168. 630kg Hereford to £167. 840kg Shorthorn dairy to £159. 610kg Shorthorn to £136. 540kg Limousin to £189. 560kg Belgian Blue to £187. 660kg Simmental to £184. 670kg Simmental to £183. 740kg Charolais to £182. 560kg Charolais to £176. 710kg Simmental to £168. 480kg Blonde d’Aquitaine to £164. 490kg Charolais to £162. 500kg Aberdeen Angus to £157. 540kg Simmental to £150. 600kg Holstein to £143. 480kg Shorthorn beef to £136. 500kg Simmental to £130. A good steady demand in this section with forward lots selling to £1,295 for a 610kg Charolais (£212), 620kg Charolais to £,1275 (£205), 580kg Charolais to £1,210 (£208) and 570kg Charolais to £1,125 (£197) for Martin Donnelly, Loughgall. T Woods, Enniskillen 680kg Limousin to £1,295 (£190), 730kg Charolais to £1,270 and 610kg Charolais to £1,190. P McGeary, Pomeroy 660kg Blonde d’Aquitaine to £1,275 (£193) and 590kg Blonde d’Aquitaine to £1,260 (£213), S Mallon, Armagh 630kg Charolais to £1,255 and 600kg Charolais to £1,170. S McClelland, Portadown 540kg Limousin to £1,205 (£223), 560kg Limousin to £1,150 and 510kg Charolais to £1,120 (£219), H Brown, Pomeroy 550kg Limousin to £1,175 (£213), Dungannon producer 690kg Hereford to £1170 and 650kg Limousin to £1,140. P and S O’Neill Coalisland 540kg Limousin to £1,165 (£216), Beechmount Farms, Ltd. Moira 530kg Charolais to £1,155 (£218) and J Armstrong, Maguiresbridge 550kg Charolais to £1,150 (£209). Beechmount Farms Ltd, Moira 490kg Charolais to £1,060 (£216), 450kg Limousin to £1,045 (£232), 460kg Limousin to £1,040 (£226), 480kg Limousin to £1,000, 470kg Limousin to £960, 480kg Limousin to £960 and 460kg Charolais to £940. H Brown, Pomeroy 470kg Aberdeen Angus to £1,035 (£220) and 450kg Limousin to £895. S McClelland, Portadown 490kg Blonde d’Aquitaine to £1,015 and 470kg Charolais to £1,015. J Holmes, Fivemiletown 500kg Limousin to £985, 440kg Charolais to £975 (£221) and 480kg Limousin to £925. J McStay, Lurgan 480kg Belgian Blue to £960, 460kg Simmental to £930 and 470kg Limousin to £880. P McGeary, Pomeroy 470kg Blonde d’Aquitaine to £950. J Quinn, Coalisland 420kg Aberdeen Angus to £920 (£219) and S Hetherington, Dungannon 470kg Limousin to £900. T Lockhart, Dungannon 340kg Limousin to £595. T Dillon, Beragh 340kg Friesian to £450. A brisk demand in this section with forward lots selling to £1,200 for a 660kg Charolais (£182), £1,155 for a 570kg Simmental (£202), 580kg Limousin to £1,130 (£195), 630kg Charolais to £1,120, 560kg Charolais to £1,085 and 560kg Simmental to £1,050 and 570kg Limousin to £1,000 for C Beagan, Clogher. N Tierney, Dungannon 630kg Belgian Blue to £1,200 (£190) and 600kg Limousin to £1,035. M McCaffery, Rosslea 530kg Charolais to £1,095 (£206), 540kg Charolais to £1,090 (£202), 530kg Charolais to £1,065, 560kg Charolais to £1,040, 550kg Hereford to £1,040, 500kg Charolais to £1,020 and 500kg Charolais to £1,000. P and P Clarke, Derrylin 510kg Charolais to £1,060 (£208). J J Sharkey, Fivemiletown 500kg Charolais to £1,070 (£214), M McCaffery, Rosslea 470kg Charolais to £980 (£208), 480kg Charolais to £965 and 460kg Charolais to £860. 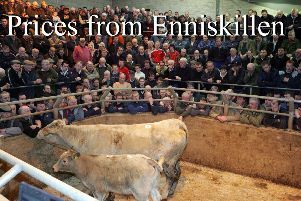 N Espie, Cookstown 450kg Charolais to £960 (£213), 410kg Charolais to £825 and 440kg Limousin to £820. T Dillon, Beragh 430kg Charolais to £765. J Gildernew, Dungannon 470kg Charolais to £765 and 440kg Charolais to £720. T Lockhart, Dungannon 400kg Charolais to £735 and 430kg Charolais to £680. N Espie, Cookstown 400kg Charolais to £800, M McAnenly, Ballygawley 390kg Limousin to £730. T Dillon, Beragh 400kg Aberdeen Angus to £610, 400kg Shorthorn beef to £565 and 330kg Aberdeen Angus to £535. A seasonal entry sold readily with steers and bulls selling to £1,100 for a 470kg Charolais (£234), 390kg Charolais to £960 (£246) and 420kg Limousin to £950 (£226) for R McKeever, Armagh. G R O’Donnell, Killadeas 600kg Simmental to £1,100 (£183), M Beacom, Ederney 560kg Charolais to £1,100 (£196) and 440kg Limousin to £770. L R Johnston, Maguiresbridge 460kg Charolais to £895. A C Moane, Cooneen 490kg Belgian Blue to £895. D Mclaren, Omagh 420kg Charolais to £870 and 350kg Charolais to £775 (£221), R Douglas, Portadown 340kg Charolais to £800 (£235), 320kg Charolais to £780 (£244) and 320kg Charolais to £775 (£242), B O’Hara, Coagh, Cookstown 400kg Simmental to £800 (£200) and 370kg Simmental to £780 (£211), M Parker, Armagh 380kg Blonde d’Aquitaine to £800 (£210), A McAleer, Pomeroy 330kg Charolais top £790 (£239), J Kerrigan, Kesh 340kg Charolais to £790 (£232), T R Johnston, Irvinestown 310kg Limousin to £790 (£255) and D Corr, Coalisland 380kg Limousin to £780. G Mulholland, Crumlin 470kg Limousin to £950 (£202) and 310kg Limousin to £660 (£213), G R O’Donnell, Killadeas 480kg Simmental to £840, C J M Bradley, Dromore 480kg Charolais to £830, B McKeever, Armagh 330kg Limousin to £820 (£248), 320kg Limousin to £800 (£250) and 350kg Limousin to £780 (£223), A McAleer, Pomeroy 440kg Saler to £800 and 290kg Charolais to £680 (£235), M Parker, Armagh 400kg Limousin to £800 and 310kg Limousin to £685 (£221), T and J Finlay, Ballygawley 380kg Limousin to £775 and 390kg Charolais to £730. D McLaren, Omagh 370kg Charolais to £770. L R Johnston, Maguiresbridge 340kg Charolais to £740, 270kg Limousin to £690 (£255), 260kg Limousin to £675 (£259) and 230kg Limousin to £660 (£287), R Little, Newtownbutler 370kg Aberdeen Angus to £705 and 400kg Belgian Blue to £655. A good selection on offer sold to a very strong demand with P Wilson, Derrygonnelly selling calved heifers to £1,845, £1,815, £1,800 twice and £1,520. M Robinson, Ballygawley £1,710 for calved heifer. William Loughrin, Caledon £1,400 twice for calved heifers. R Givan, Dungannon £1,300 for calved heifer. Lots of others selling from £960 to £1,260. M Connelly, Clogher £2,030 for pedigree registered Charolais (born 08/08/2017) and B McBride, Trillick £1,980 for pedigree registered Aberdeen Angus. A larger entry this week sold to a very firm demand with B D Breen, Eskra selling a heifer with bull calf to £2,200, heifers with heifer calves to £2,160, £2,130 and £1,950. R J Woods, Garvary £1,400 for second calver with heifer calf. J Coulter, Fintona £1,340 for heifer with heifer calf. B Doonan, Kinawley £1,265 for heifer with heifer calf. J McAvinue, Derrylin £1,055 for heifer with heifer calf. M McCaffery, selling from £900. Incalf cows and heifers sold to £1,000 and £960 for H Cashel, Aughnacloy. 600 for Charolais Crawford, Stewartstown, M Howe, Enniskillen £350 for Hereford. D M Mallon, Ballygawley £340 and £265 for Aberdeen Angus and £270 for Hereford. N V Prentice, Tempo £330 for Belgian Blue, R J Hoy, Monea £290 for Charolais, O Mitchell, Eskra £285 for Hereford. B T Gardiner, Tempo £285 for Saler. R W West, Maguiresbridge £280 for Aberdeen Angus, D I Hoey, Maguiresbridge £270 for Aberdeen Angus and R Robinson, Maguiresbridge £270 for Simmental. R D Dane, Lisbellaw £340 for Limousin, E Donaghy, Dungannon £325 and £305 for Aberdeen Angus. M/S E and A Thompson £305 and £270 for Herefords. D M Mallon, Ballygawley £290 for Aberdeen Angus and A Johnston, Clogher £265 for Limousin. A McGovern, Newtownbutler £605 for Charolais and £600 for Limousin, R Downey, Fermanagh £600 for Charolais, Mary Owens, Maguiresbridge £590 for Hereford. S McKeown, Sixmilecross £580 for Charolais £505 and £480 for Limousins. Lisbellaw producer £555 for Limousin, C Robinson, Ballygawley £530, £505, £485, £450, and £430 twice for Limousins. H Connelly, Rosslea £510 for Friesian. G Foster, Kinawley £475 and £435 for Aberdeen Angus. S McKeown, Sixmilecross £635, £620, £600, £555 and £455 for Charolais. J Keys, Clogher £600 for Aberdeen Angus £505, £470, £460 for Charolais, £480 for Hereford and £480 for Limousin, Lisbellaw producer £600 for Limousin, Mountview Cattle, Dungannon £580 for Charolais and £565 for Limousin, A McGovern, Newtownbutler £550 and £535 for Charolais. H Connelly, Rosslea £450 twice for Herefords. M and L Kelly, Newtownbutler £445 twice for Herefords.